We all know how much fun Instagram can be. Adding some really stunning effects to your smartphone images in the click of a button is great. But adding them in Photoshop can also be fast and simple, if you know the right moves. Lets take a quick look at how to accomplish an easy “Instagram Look” in just a few steps. Start with a good photo. This may seem obvious to some, but that’s not always the case. There’s no Instagram setting available that is going to turn a bad photo into a good one. Trust me. Part of the appeal of Instagram, in my opinion, is the square cropping. Why? Because it’s different. It’s not portrait, it’s not landscape… it’s something completely new. Cropping a photo to a square can sometimes be a challenge. You want to try and get everything important into the square so the new photo reads the same as the original. Here is the photo cropped using the Crop Tool (C). Hold the Shift key down as you click and drag out the crop area. Press the enter key to complete the crop. 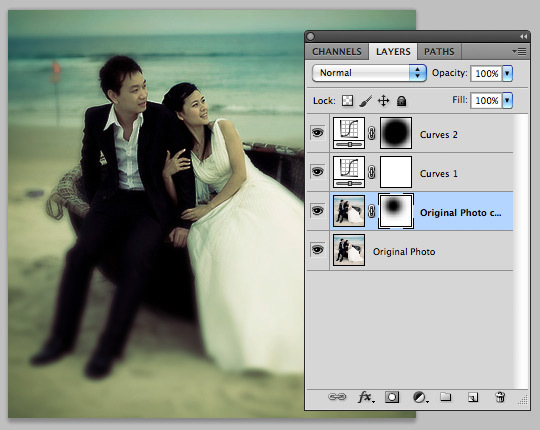 A little goes a long way here, so don’t overdue your cross processing. To add the cross processed look, I created a Curves adjustment layer over my photo. 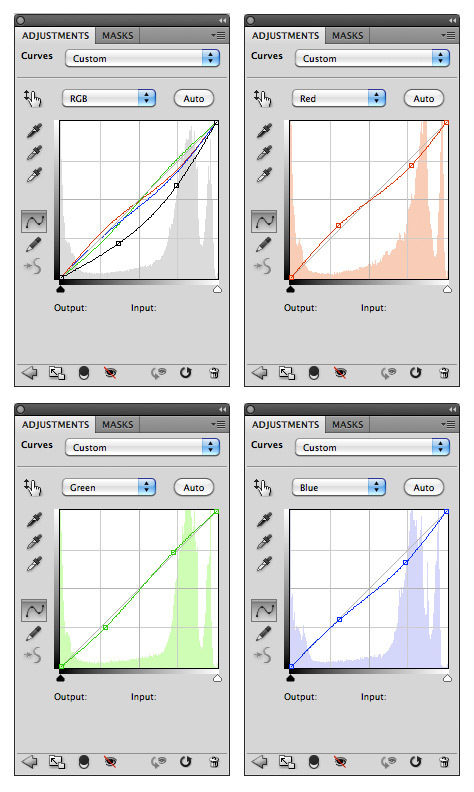 I used the following settings for my Curves adjustment. Here’s a look at the photo with these adjustments. Pretty big difference for one simple adjustment layer, huh? What’s a vintagey Instagram look without a nice vignette? Or maybe you’re asking “What’s a vignette? A vignette is that darkened edge effect that you see on a lot of vintage photo effects. Here’s how to create one in a single step. 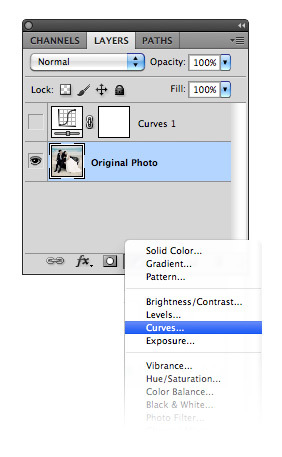 Create a new Curves adjustment layer. On the adjustment layer’s mask use a large soft black brush to paint a circle in the center of the image. Now when you make this adjustment it will only effect the outer edge of the photo where the white appears on the mask. Adjust the RGB curve to something similar to what I have below. Here’s a look at the newly created subtle vignette. Instagram gives you the option to blur the edges around the subject matter of a photo. You can control the position and size of the focus area as well. Lets take a quick look at how to achieve the same effect in Photoshop. 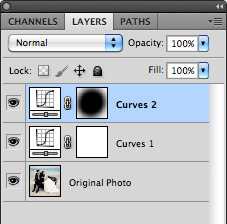 Duplicate the original photo layer, and create a new layer mask for the layer copy. 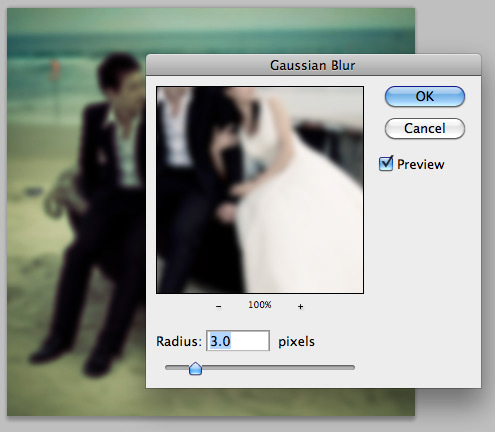 Run a Gaussian Blur (Filter | Blur | Gaussian Blur), and choose an amount that blurs the details of the photo. Now on the layer’s mask, use a soft black brush to paint the area that you want to be in focus. This is essentially revealing the layer below that is not blurred. For this photo I chose the area over the subjects faces. Some of the effects in Instagram add a cool border effect. For this image lets add a nice rounded white border. 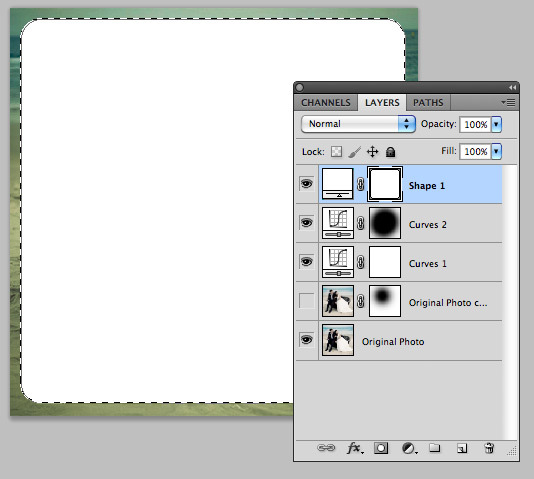 To do that, choose the Rounded Rectangle Tool (U) from the tools panel. While holding the shift key draw a rectangle in the center of the image. This creates a vector shape layer. Cmd+Click the vector shape layer’s mask to create a selection from the shape. Now create a new layer above all others, then press Cmd+Shift+i to invert the selection. 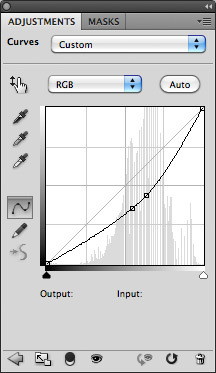 Press (D) then (X) on the keyboard to reset the colors and make white the foreground. Then fill the selection by choosing (Edit | Fill) or by using the Paint Bucket Tool (G). You can now delete the vector shape layer. There you have it! I hope this little exercise has inspired you to create your own Instagram style vintage photos. Experiment and have fun!